We put the Prince through his modern day paces. 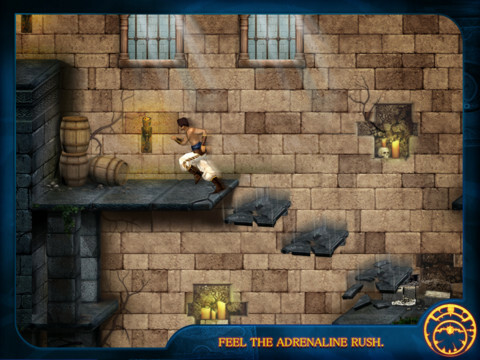 With mobile gaming providing such a handy home for all those fondly-regarded favourites of yesteryear, it's hardly a surprise to see Prince of Persia making an appearance on the scene. What is interesting though, is that this isn't the first time the game has been released for touchscreen devices. 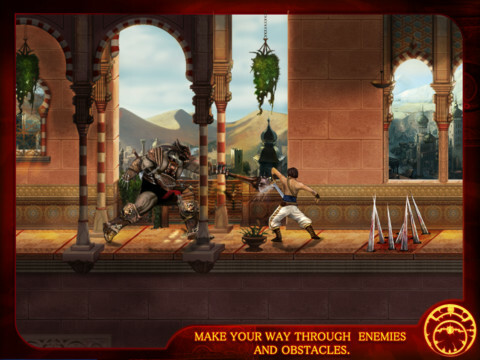 Back in 2010 a version of the game titled Prince of Persia Retro was released to coincide with the opening of the film, The Sands of Time. While the game itself was a faithful port of the 1989 original (from the classic visuals to the animation style that so wowed gamers when home gaming's first true decade drew to an end), the game was blighted by fussy and unresponsive touchscreen controls. The controls are much improved in this most recent release. Fast forward a little and the franchise has enjoyed a more loving touch since then, and this port of the HD remake released on the Xbox Live Arcade platform in 2007 hits all the right notes. The controls are solid, and make use of a surprisingly accurate virtual stick which you tease left and right in order to perform the Prince's graceful acrobatics. Crouches, leaps, and short-stop halts are controlled using buttons on the right-hand side of the screen. 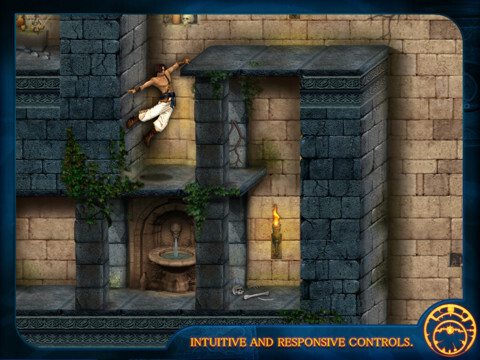 Prince of Persia's simplistic combat is equally easy to participate in, and whenever you approach an enemy the Prince adopts a combat stance with block-and-retaliate combat mechanics appearing on the screen. Combat never amounts to more than simply blocking your attacker's initial assault before responding, but this is every inch the Prince of Persia we all know and love. The visuals of the game have also been given a gorgeous lick of paint, and the high-definition updates really shine on the iPad with flickering fires and intricate brickwork adorning the walls of the Persian palace. The classic environments have been lovingly enhanced. The game provides three modes of play as you traverse the spikes, spine-crushing falls and crumbling platforms that make up the environments. Time Attack requires you to finish all 14 levels within an eye-watering time limit of one hour, while Survival puts you against the clock with only a single life available. Thankfully, there's also a Normal mode where you can complete the game without suffering time or death penalties. This may be the point where you wish you'd played on Normal mode. Without your own fond memories of the original you may wonder what all the fuss is about. By modern standards the combat is basic, and the animation system that so impressed gamers in 1989 is something we all take for granted these days. What matters though is that mobile gamers can at last enjoy a faithful and enjoyable act of service to a treasured gaming franchise, and it's one that takes advantage of all the graphical bells-and-whistles that modern hardware spoils us with. What's Hot: Updated graphics, solid controls, and a faithful reworking of a classic. Varied game modes.